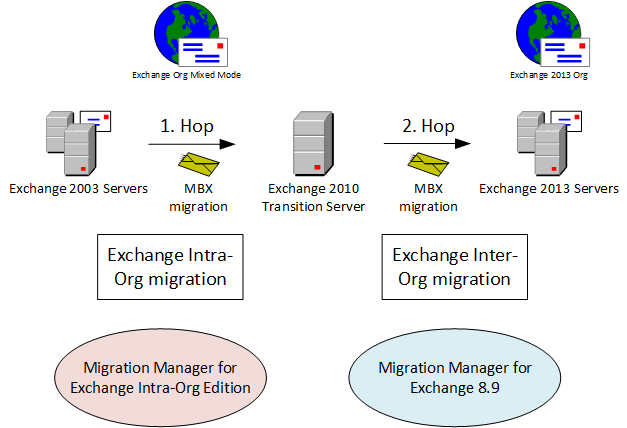 Is that a mistake that the middle server says exchange 2013? Yes, it was. Thank you for heads-up. Corrected. I believe this is a known thing, that you can’t migrate directly from exchange 2003 to 2013. You will have to either migrate exchange 2003 to 2007 or 2010, and then 2013. Hello Gulab, that is exactly the Point where 3rd Party Tools will enter the Scene. Due to Dell’s announcments with Quest Migration Manager it will be possible to do a single-hop Exchange Migration from Exchange 2003 to Exchange 2013 which is an interesting Scenario for many large scale IT customers. Also, a Inter-Forest Active Directory Migration into a native 2012 AD environment should be possible with the new QMM Version. By now, ADMT is not capable of doing this.